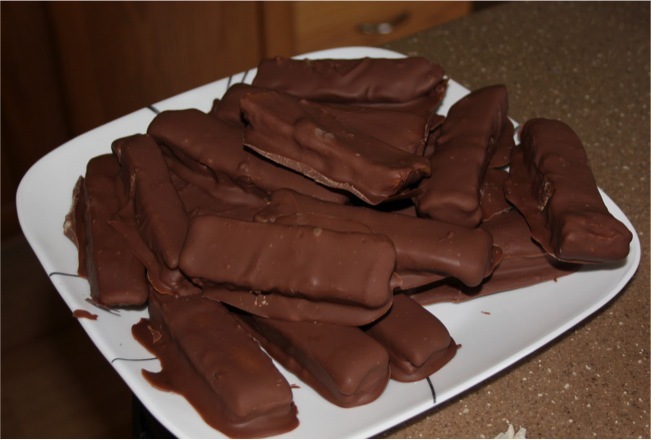 Juneberry Lane: Heavenly Desserts: Homemade Twix Bars...YUM!!! 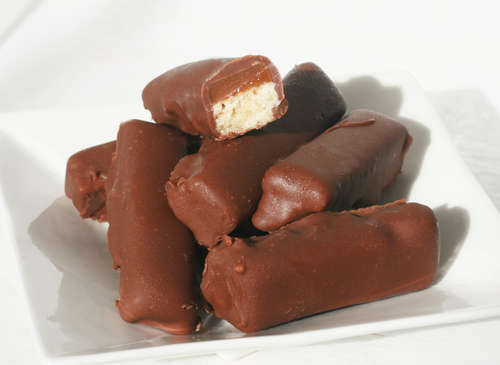 I just love the thought of turning your favorite store bought candy bar into the yummiest of homemade treats that you can put together yourself, using ingredients of your own choosing and substituting whatever you need or want to!! 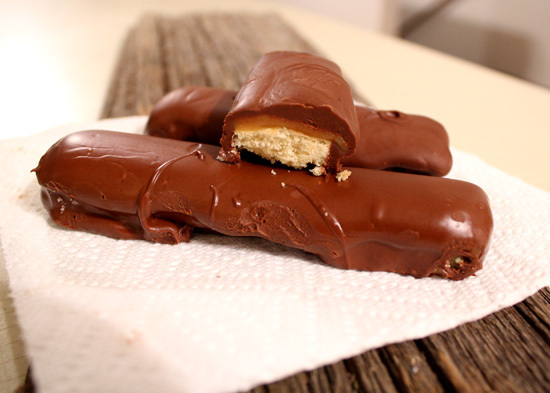 So today's recipe from food.com for homemade Twix Bars seems like the perfect little weekend treat to surprise your family with, don't you think? Take a look . . .
1. First, prepare the shortbread cookie base. Preheat the oven to 350 degrees F. Prepare a 13x9 baking pan by lining it with aluminum foil and spraying the foil with nonstick cooking spray. 2. Place the butter and the granulated sugar in the bowl of a large mixer and beat them together on medium speed until light and fluffy, about 3 minutes. 3. Add the flour and salt and mix on low speed just until the flour is incorporated. 4. Scrape the dough into the prepared pan and use your hands to press it into a thin, even layer. Bake the shortbread for a total of 18-20 minutes, turning halfway through so it cooks evenly. When it is finished it should be a light golden brown color. Don't overcook it, or it will be very crumbly. Allow the shortbread to cool completely. 5. To prepare the caramel layer, placed the unwrapped caramels in a large microwave-safe bowl with 2 tablespoons of cream. If your caramels are very stiff, you might want to increase the cream by an additional spoonful. This candy bar works best if the caramel is not too hard or chewy, so adding some cream when melting the caramels helps make it silky smooth. 6. Microwave the caramels until melted and smooth, stirring after every 30 seconds to incorporate the cream and prevent overheating. Pour the melted caramel over the shortbread cookie crust and smooth it into an even layer. Refrigerate the pan to set the caramel completely, about 1 hour. 7. Melt the chocolate or candy coating in a microwave-safe bowl and stir until completely smooth. 8. Remove the caramel-covered bars from the pan by using the foil as handles. Cut the pan into thin, finger-width bars. I usually cut the pan in half widthwise, then cut about 10 bars from each half, for a total of about 20 long, thin bars, but you can vary the size to suit your needs. Use a large, sharp knife to prevent the cookie base from crumbling. 9. Use dipping tools or forks to dip the bars in the melted chocolate, covering them completely. Place the dipped bars on a foil-lined tray and repeat until all bars are dipped. Refrigerate the tray to set the chocolate, about 10 minutes. 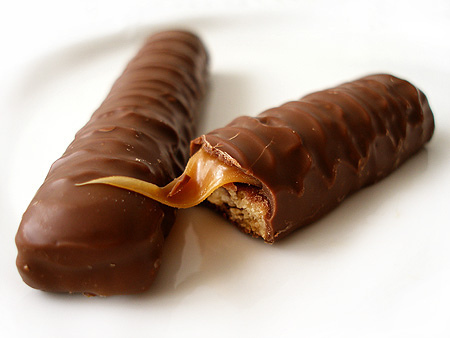 10.Store homemade Twix Bars in an airtight container in the refrigerator for up to a week. These are best when allowed to sit at room temperature for a few minutes before serving, so that the caramel can soften. Now keep in mind, these can be a bit gooey, messy, and are definitely not going to be uniform in shape like the kind you find in the supermarket line...but that, to me, makes them even more delicious! Enjoy! !